The main reason I go through the process of keeping a database of homebrew figures is to run analysis on the results and hopefully learn something from each batch. In this case, I’m looking at finding the correlation between the percentage of keg hops a batch has and my ability to detect hop aroma in the finished beer. To do this, I used the figures for the 23 hoppy beers I have entered into the database after removing the non-hoppy and wild beers. 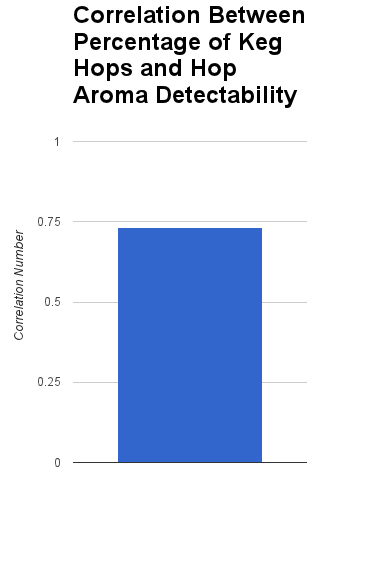 Although I already suspected that adding hops to a keg and leaving them in during consumption would increase my ability to detect hop aroma, I wanted to see if I could put a statistical number on the process. For each beer I brew, one of the many data points I record in the tasting phase is on a score from 0 to 5 my ability to detect hop aroma in the finished brew (0 = none to 5 = highest). In addition, after each beer’s ingredients gets entered, the percentage of keg hops to the overall dry hop build gets automatically calculated. 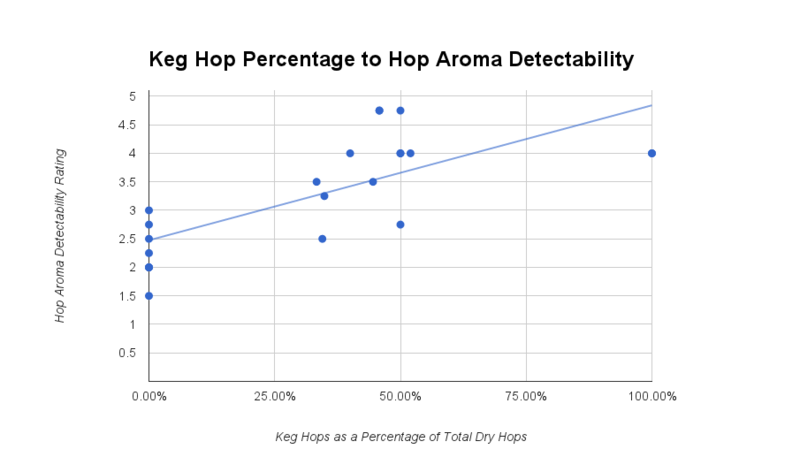 To test the data in this particular case, I ran a correlation between the hop aroma detectability score and the percentage of keg hops to the overall dry hop build. The result showed a positive correlation coefficient of 0.73. Although a correlation does not imply causation, that’s a fairly convincing number. Remember a correlation of 1 is a perfect positive correlation. Looking at the scatter chart below of the same set of data, it’s clear that the process of dry hopping in the keg shows an upward trendline of detecting hop aroma in the finished beer. Remember that the beers with a 0.00% keg hop additions did receive dry hopping prior to kegging or bottling. Again, I’m not shocked by the results, but it’s interesting to see it presented in an analytical form. Of course, all of this data is accumulated by beers brewed with my chosen methods for brewing. In other words, if you have some crazy effective method of dry hopping your beers prior to kegging then your results could vary. In my case, I switched up the dry hopping process often, which can be viewed in the database. Some batches were dry hopped for a week and some for a few days. Other batches were dry hopped in multiple doses at both high and low temperatures, but those are all variables for future analysis. Having said that, the one takeaway that is clear to me is that if my goal is to get a huge hit of hop aroma in the finished beer, I probably will not get there by bottling/priming (sorry non-keggers). As you can see from the chart above, none of the beers that were only dry hopped prior to kegging received a hop aroma score above 3 (which is obviously any hoppy beer bottled/primed), while every beer except two that received keg hops scored above 3. Quick question: when are you tasting and rating your beers for keg hopped beers? Is it after the time you decided for dry hopping or maybe later as this correlation could be due to keg hopped beers been dry-hopped longer (on average) than non-keg hopped ones. I did these ratings after the beer had been keg hopped for awhile on tap. However a good number of the beers included in the charts were not keg hopped at all, which is where you see the strong correlations of increased hop aroma detectability with the keg hops.